If you’ve examined your air conditioner this spring, you might have noticed frost or ice forming on the evaporator coils. It might like seem like a huge concern, and indeed it’s a reasonably common condition. Unfortunately, it signals a larger problem that you should deal with before the summer comes. The longer it’s allowed to continue, the more damage it causes your air conditioner. The evaporator coils serve as the heart of the air conditioner: the point where the air is actually cooled. Refrigerant enters the coils under a high amount of pressure and in liquid form. It expands in the coils and shifts back to gaseous form, pulling heat from the surrounding air in the process. The cool air can then be blown into your house with a fan while the gaseous refrigerant returns to the beginning of the system to be pressurized and liquefied again: continuing the process in an endless loop. That’s a very delicate process, depending on set amounts of a specific type of refrigerant to work. When the process gets thrown off, ice or frost is the result. It’s a problem because it forms an insulating layer between the refrigerant and the air it’s supposed to cool. That increases the strain on the system, forcing it to work harder to cool your home and raising both your monthly energy bills and the risk of a breakdown elsewhere in the system. Even worse, the situation tend to become more dire as time goes on: more ice forms, the air conditioner has to work even harder, the air never gets quite as cool as it needs to and if the situation isn’t addressed, it will result in a serious breakdown. Refrigerant Leaks. 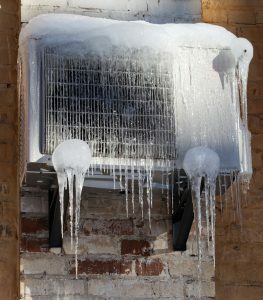 If the refrigerant is leaking from somewhere in the system, it throws off the delicate relationship required to cool the air and frost is the typical result. Dirty Coils. Dirt or dust on the coils can result in frost forming. This can be a problem in the spring, after a long winter where the air conditioner has sat unused for several months. Blockages or Clogged Filters. A blockage in the system won’t allow the cool air to flow through the ducts like it should. It will stay in the system itself, creating frost and ice in the process. Running the AC with Cool Air. If the air is too cool and the AC runs anyway, frost is a likely result. You should especially watch out for this if you run the air conditioner in the evening. As you may notice, none of these issues are connected to the coils themselves. That’s why you should never attempt to scrape the ice off of the coils: you might damage them and the ice will only reform anyway. Neither should you ever attempt to diagnose or correct the issue on your own. Instead, turn off the system and call a repair service right away! For quality air conditioning repairs in Columbus, OH, call Quality Air Heating and Air Conditioning.